I made this card a couple of months ago, just playing with some paper. I felt at the time that it was missing something but for the life of me could not find something to add. In the end I sent it out as is with a cute happy Birthday inside. 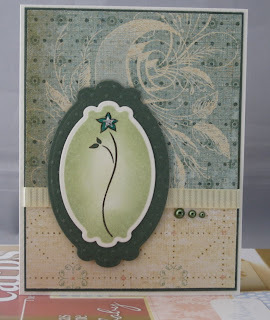 I used a Cuttlebug for the Swiss Dots embossing, then used a Spellbinders Labels Ten for the die cuts. Supplies: cream and green cardstock, Designer paper-K&Company Ancestory, Denami Design-Elegant spring flower, misc ribbon, gem and pearls. Did someone say 'Cookies'? No stamping for me this weekend, but I did spend one whole day in my kitchen... yup the whole day-4 batches of cookies, 1 batch of a biscotti gone wrong (which became a dipping biscuit). 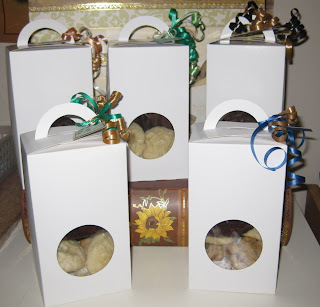 My husband is mixing up his job a little, so as a little bye bye gift I made cookies and put them in these cute little boxes and added tags for each for his co-workers. Mexican wedding cookies, Lemon Ricotta cookies, Oatmeal and cranberry cookies, Double chocolate cookies and Cranberry, lemon and chocolate biscotti, that turned into biscuits because I missed a crucial step in the biscotti making steps. After the kitchen was all clean I started all over with a full Roast beef dinner with mashed potatoes, Yorkshire pudding, salad and roasted veg tossed in this amazing mixture of black cherry vinegar, brown sugar, garlic, pepper and a touch of salt. Maybe I will have a card later in the week, I used my new stamps on the tags but they are small and not worthy of a post. I knew that I would like this designer paper on a card, I was just not sure what type. This cute card is for a toddlers birthday. I hope he likes slimy critters. 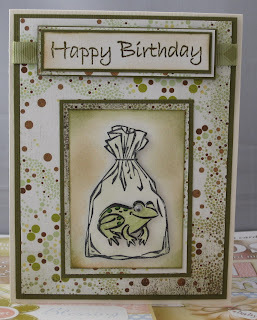 I created layers with this card then also popped up the Happy Birthday with some foam tape, the frog is 2D also with foam tape. 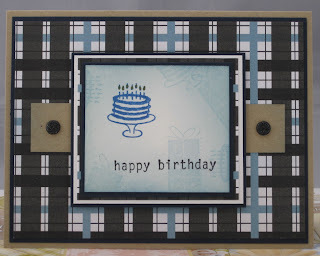 Supplies: Cream, white and green cardstock, Designer paper-Basic Grey Hotstone, Stampin' Up-All Wrapped up, The Artful Stamper-Happy Birthday, WE R Memory Keepers Designer ribbon, random googly eye. I did not play with my new stamps as much as I wanted but I did finish off a couple that were needed. This card is for a teenage boy. Supplies: Craft, blue and white cardstock, Designer paper – Autumn Leaves Work Shirt, A Muse Stamps – Cake on Stand, Stampin’ Up! – Birthday Whimsy, Doodlebug-Black sugar coated brads. I have to admit that my creative ideas have not been in the forefront of my mind. In fact I am behind in the cards that should be made and I am getting some of them done moments before they are out the door. Usually in cases like this I will take a trip to the local stamp or craft store and buy me a little something, however I have been trying to watch my craft spending. My wonderful husband and son spoiled me for Mother’s day with a nice (generous) gift card to a local stamps store. Today was my day, I went shopping. I have idea’s wonderful ideas, even though the sun is out (and I am at work) I just want to rush home with my new treasures and create. First things first, I stocked up on some of the items that are in need, I was running low on my Scotch double sided mounting tape, then came some Ink Essentials foam and applicator, some little daubers. Then came the additions, Distress inks in Frayed Burlap and Brushed Corduroy and Thomas Kincaid Christmas paper (yes Christmas). Lastly was my Memory Box Fix, just on the shelves new 6 x 6 Jubilee paper and some new stamps. These are some of the new stamps on display, I love all of these but I only ended up buying two as I wanted to save a little bit on my gift card for my next lapse in creativity. 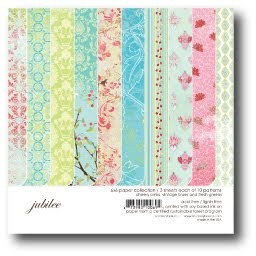 This is a teaser of Jubilee, the paper are so pretty. If I am lucky I will have a card or two to post near the end of the week. Who am I kidding it is Thursday, the rain is suppose to return on Sunday maybe that will be a good day to lock myself in my craft space. Simple lines, a few layers but not too much fuss and all was done. The chopper is coloured with my Spica glitter markers, I could not resist a little glitz. I don't recall where I got the Harley Davidson embellishment but it was exactly what I needed to complete the card. 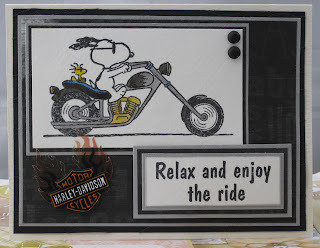 Supplies: cream , silver and black cardstock, Designer paper – Reminisce signature series Vegas, Stampabilites – Snoopy’s chopper and Relax and Enjoy, misc Harley Davidson embellishment, Pebbles Inc- Black candy dots. Labels: All about the bike.